By BoltBait, June 30, 2018 in Plugins - Publishing ONLY! 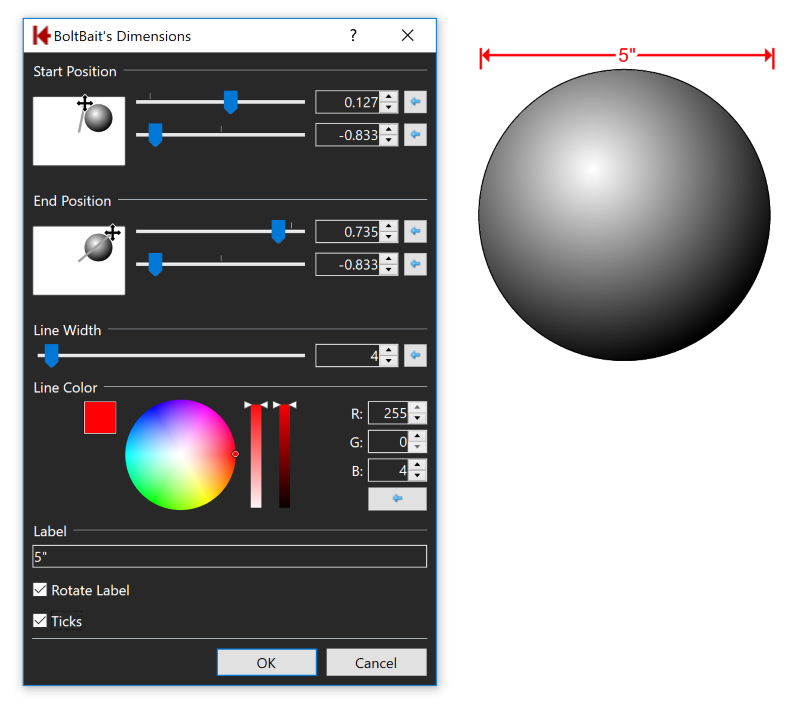 Render dimension arrows on your canvas. This will NOT measure anything and will NOT convert pixel length to another unit of length. Save to your desktop, unzip files to your desktop and run the installer batch file. // we can now convert these to actual pixel co-ordinates. As I said, this should be cleaned up because the section on calculating the starting and ending coordinates contains a bunch of duplication because I simply copies large blocks of code from other plugins. 1.2 7/1/2018 Fixed a bug where it would clear the canvas when OK was clicked. 1.1 7/1/2018 Text surrounded by transparency instead of white. Yup. The white edges aren't perfectly vertical - but this is only obvious at large sizes. After OK the dimension disappears from the canvas and the background color is deleted. It only takes seconds to use line/curve, customise the ends, add the measurement (in the font of choice) and rotate/place where required. Yes, the measurement isn't mid-line, but that only takes a few seconds more. You're right. Something has gone wrong with my latest build. ? EDIT: This has been fixed now. For the dozen people who downloaded v1.1, download v1.2 and everything will be fine. Sorry about that! If you don't find it handy, don't download it. Not every plugin is for everyone. In this case, someone requested the plugin. So, I'm sure at least 1 person will find it handy. Thanks for your effort, for the plugin, and also for the code. For me it is very useful. ❤️ Sir @BoltBait! Thank you very much for your effort. ?